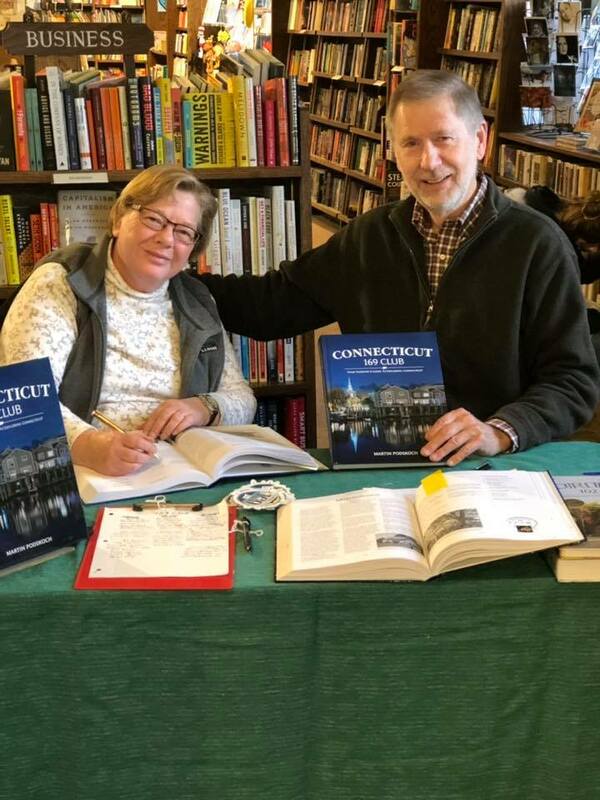 Author and historian Martin Podskoch will sign copies of his book The Connecticut 169 Club: Your Passport and Guide to Exploring Connecticut, with contributor Barbara Hampton at The Hickory Stick Bookshop on Saturday, December 22nd at 2pm. Author, adventurer and historian Marty Podskoch scripted a brilliant solution for fragmented families and town-tied locals. With his latest CT Travel Guidebook – The Connecticut 169 Club: Your Passport and Guide to Exploring Connecticut. Podskoch navigates readers from out behind the blue screen, off the interstate and onto Connecticut backroads to meet and merge with fascinating neighbors and uncover cool curiosities tucked into the 169 towns and cities in the Nutmeg State. Visit them all; get your passport book signed or stamped in each of the burgs, make notes in the space provided and you’re a member of an exclusive club ­– complete with an official Leatherman patch. The patch commemorates this legendary vagabond, who during the late 1800’s – in head-to-toe leather – travelled a 365-mile circuit between the Hudson and Connecticut Rivers while camping out in caves. There is also an annual meet-up event with fellow members, plus the ultimate takeaway: a volume with indelible memories of adventures on the road! Martin Podskoch is an Author, Historian and East Hampton, CT resident recognized for his extensive work documenting the history of the Catskills, Adirondack Fire Towers, and the Civilian Conservation Corps camps. His first travel guide, “The Adirondack 102 Club: Your Passport & Guide to the North Country” has become the best-selling travel guide book in the Adirondacks.